Save yourself time and money on your project by purchasing this horizontal vent installation kit. Made specifically to provide venting for corn and pellet-fueled stoves and inserts, this 4-inch diamter kit includes one round horizontal rain cap, once wall thimble with 1" clearance and one 3" to 4" black increaser/appliance adaptor. Manufactured by PelletVent Pro, this kit not only provides you with all of the items you need, but it also gives you a limited lifetime warranty on your supplies! Venting your corn or pellet burning stove through a cathedral ceiling requires a specially designed part that accommodates the pitch of the ceiling. This kit is to be used with 4" PelletVent Pro vent pipes and contains one 3" to 4" black increaser/appliance adaptor, one cathedral ceiling support box, one storm collar, adjustable roof flashing, and one vertical rain cap. PelletVent Pro is rated for continuous use flue temperatures that are up to 570� F.
This kit provides all the parts needed for venting corn and pellet-fueled stoves and inserts through a flat ceiling. It is compatible with the 4" PelletVent Pro vent pipes. The kit includes one vertical rain cap, an adjustable roof flashing, the storm collar, a cathedral ceiling support firestop spacer and a 3" to 4" increaser/appliance adaptor. The PelletVent Pro system uses laser-welded double-wall pipe to create vents that match the particular requirements of pellet burning stoves. This adaptor is a venting system that connects most pellet and corn appliances to PelletVent Pro Vent Pipe. Safe and effective, this system is rated for continuous use flue temperatures up to 570 degrees Fahrenheit. This Dura-Vent PelletVent Pro is well constructed with laser-welded, double-walled pipe, an inner wall of .012" stainless steel and a .018" laser-welded galvalume outer wall. It features 1'' clearance to combustibles in the USA, and 3'' in Canada for wood pellets or oil, and also a 4'' pipe opening. Dura-Vent present this simple and efficient adapter that easily attaches to a flue collar, and is available in an attractive black exterior finish. This appliance adaptor from PelletVent Pro can help connect most pellet appliances to Pro Vent piping. With this accessory, you can use your wood pellet or oil fuel fireplace with a traditional ventillation system. The versatile design allows this tool to be used with either vertical or horizontal installations, and the absorbant material ensures that only 1 inch of clearance is needed from combustibles. The convenient design easily connects to your flue collar to create an easy transition for your vent system. This ceiling support and firestop spacer is required when the vent piping must pass through a ceiling. The part provides a 1" clearance to combustibles and includes the support clamp. It comes in a sleek black finish and will fit PelletVent Pro vent pipes with a 4" inner diameter. This system is used to vent stoves and fireplace inserts that burn corn or wood pellets. The ceiling support carries a limited lifetime warranty and has dimensions of 9" x 9" with a 4.75" pipe opening. This part is used to support vertical vent pipes that pass through a ceiling. It can be used on either flat or cathedral ceilings and comes with both the clamp and the trim that creates a finished look. It comes in a sleek black finish. This part will fit PelletVent Pro vent pipes with a 4" inner diameter. There is a limited lifetime warranty on this part. It has dimensions of 14.75" W x 14.75" L x 14" H with a 4.75" pipe opening. If you have any vent piping passing through your attic then you will need this specially designed insulation shield for your piping. PelletVent Pro's insulation shield gives your home extra protection by preventing insulation from accumulating near your vent piping. It also provides a 1 inch clearance to combustibles and fits well with vent pipes that have a 4 inch inner diameter. The shield is also equipped with secure twist-lock connections and includes a limited product warranty. Protecting a PelletVent Pro through-roof vent system is easy with the PelletVent Pro Adjustable Galvalume Roof Flashing from DuraVent. Because the pitch of this flashing adjusts to fit roofs with 0/12 to 6/12 pitches, you're able to get the best fit possible for your home. And that means more effective weather protection for any pellet or corn appliance vent. This item fits PelletVent Pro vent pipes with a 4" inner diameter. A limited lifetime warranty is included with this flashing. Flashing is designed to protect the vent pipe and the structure from water damage. This flashing is made of durable galvalume and is specifically designed for use on flat roofs, chase enclosures, and masonry chimneys. It will fit PelletVent Pro vent pipe that have a 4" inner diameter. The part has a limited lifetime warranty. A complete termination also includes other parts. The dimensions of the flashing are 17" W x 17" L x 11" H with an opening of 4.75". This PelletVent Pro Chimney vent pipe Storm Collar by Dura--Vent is for chimney pipes with a 4 in. inner diameter. The storm collar creates an air tight, waterproof seal to provide the best moisture defense possible, and provides added protection between your ventilation pipe and flashing during inclement weather, This storm collar is made of durable aluminum construction and features a laser welded double wall construction with an inner wall of .012 in. stainless steel and a .018 in. laser welded glavalume outer wall. Chimneys need protection from the elements. The part of the chimney that meets the outside is arguably the most critical part of all. This DuraVent PelletVent Pro Vertical rain cap is designed specifically for chimney systems on pellet and oil fueled fireplaces. It attaches to vertical chimneys that terminate at the roof. The Dura vent rain cap is constructed of durable stainless steel that will hold up to weather conditions. The Dura-Vent vertical rain cap is precision laser welded and features double walled construction for added durability. This thimble creates the passage for a vent pipe to pass through a combustible wall. 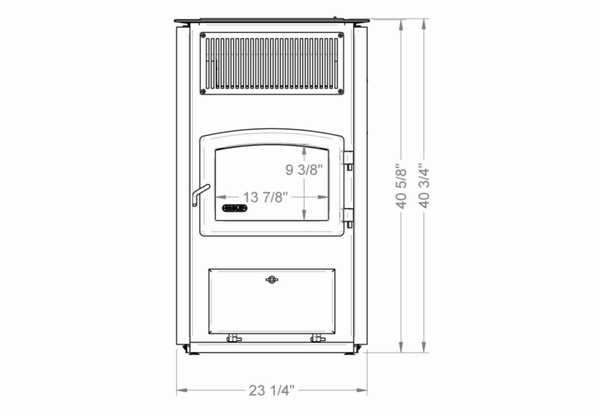 The PelletVent Pro system is designed for stove and inserts that burn wood pellets or oil and that produce continuous use flue temperature of up to 570� F. The part provides the necessary 1" clearance to combustibles and can be used with wall thicknesses from 3-7/8" to 8" and with vent pipes of 4" diameter. The thimble carries a limited lifetime warranty. Installation requires a 7.5" x 7.5" square opening. Pellet and corn fueled fireplaces are well known for their versatility and easy installation. One of the common drawbacks, however, is their incompatibility with gas fireplace vent systems. Ventilation components are sometimes hard to find. Fortunately Dura Vent offers a line of pellet ventilation products. This tee fitting allows you to connect more than one pellet fireplace to the same ventilation system. It is made of the same stainless steel that Dura Vent uses on all of their high quality products, and the seams are precision laser welded for a high quality end product. This tee can be used as a component in a venting system for stoves and inserts that are fueled by pellets or corn. The tee creates a 90� offset and the branch swivels easily to make a perfect alignment possible. It also is used to connect two appliances to a single vent. The part has a 0.012" stainless steel inner wall and a 0.018" galvalume outer wall with a sleek black finish. Laser welded seams provide security from leaks and the twist-lock connections make installation easy. The system requires a 1" clearance to combustibles. The tee comes with the cap. Dimensions of the tee are 4" inner diameter and 4-5/8" outer diameter with a height of 10". It carries a limited lifetime warranty. PelletVent Pro makes sure than any installation stable is simple and efficient with their Dura-Vent wall strap. This wall strap provides support for PelletVent Pro vent pipes and tees for whatever projects you're working on. This design was created to conveniently adjust so as to provide 1" to 3" clearance, as well as fit vent pipes with a 4" diameter. Constructed with only the strongest solid metal available, you always know that when you use PelletVent Pro designs, you're doing the job right down to the last detail. This house shield is used to protect the home's exterior from blower discharge and is designed for use in horizontal vent installations. The shield will fit the PelletVent Pro vent pipes with a 4" inner diameter. The part carries a limited lifetime warranty. Its dimensions are 12" x 12" with a 4.75" pipe opening. A complete vent termination contains other parts as well. The PelletVent Pro system is used for appliances that use wood pellet and oil fuel and is rated for continuous use flue temperatures up to 570� F.
If you have a heating appliance that uses wood pellet and oil fuel and are looking for the best ventilation, this Dura-Vent PelletVent pro round horizontal rain cap is what you're looking for. Its horizontal design allows for the best protection from wind, rain, and snow. This rain cap fits Dura-Vent PelletVents with a 4-inch inner diameter. The screen that is part of this cap protects the vent pipe from debris and things that can blow into the pipe. This is intended to be used with horizontal vent pipes. It is made from stainless steel and has a swivel collar, which makes it easy to adjust to different exhaust directions. * Please Note: This unit is approved for mobile home installation only with an outside source for combustion air. 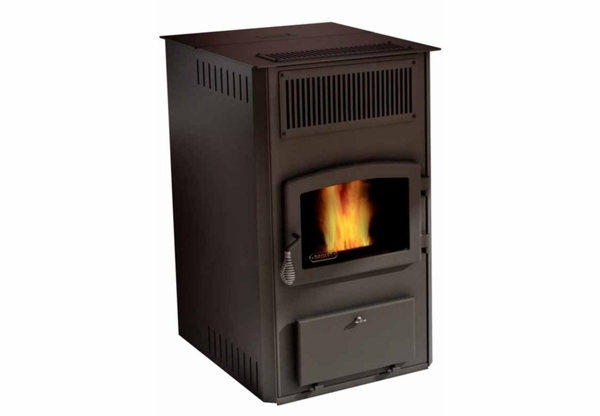 The Drolet Eco-65 High Efficiency EPA Pellet Stove is the best of the best when it comes to quality pellet-burning stoves. If you have any doubts, just ask the thousands and thousands of homeowners who rely on this stove to heat all sorts of homes. They depend on it because this metallic black, pedestal-mounted unit provides quality heat in a manner that is EPA approved for efficiency, and mobile home approved because it's so safe. It is safe, but the Eco-65 also features an electronic igniter, an ash drawer, and a ceramic glass door with a cast iron frame. It operates in either thermostatic or manual modes, it features 6 levels of intensity, and it uses bottom-feed combustion technology to maximize efficiency. That technology yields a maximum output of an impressive 65,000 BTU's per hour, and the 120 lb. hopper capacity gives the unit plenty of burn time. Combine all of those factors, and you come up with the Drolet Eco-65 EPA Pellet Stove, the class of the pellet-burning field. Can I burn corn in the Eco 65? No, this model can only burn bark and grass pellets. Does this stove come with a heat distribution kit? No, this item is the stove as shown only. Required venting components must be purchased separately, and it does not offer a heat distribution kit. Do you have an adapter from stove to 6” vertical stovepipe? While we do not have an adaptor to a 6" stovepipe, we do offer a way of connecting 3" or 4" PelletVent Pro pipe to a 6" inside diameter class A chimney; but only if the chimney pipe either DuraTech or DuraPlus brand, made by DuraVent. Does this furnace turn on and off to control the amount of heat circulating through the house? For instance, if the thermostat is set at 70 degrees will this furnace keep the house at 70 and not 90 degrees like some pellet stove do? An optional low voltage (millivolt) thermostat may be used with this stove to maintain any set temperature. This thermostat is available here. Does this stove absolutely have to be hooked up to outside air for combustion? Only if the appliance is to be installed in a mobile home is it required to be connected to an outside source for combustion air. I would also check local code requirements regarding the same for your installation. Regardless, connection to an outside air supply is recommended to help increase the overall efficiency of the appliance. 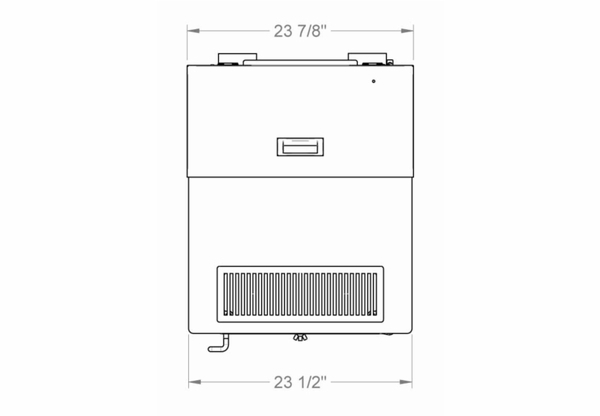 Can the Drolet Eco 65 pellet stove be installed through vinyl siding with a power vent, or does it require a chimney to be installed? This unit can be vented horizontally, through an outside wall, then directed vertically for a short run. A power vent fan is not necessary, as the unit has its own built in positive pressure combustion fan. Can the Drolet Eco-65 burn corn? Unfortunately, this unit can only burn bark and grass pellets. Can the combustion air be adjusted? The only adjustment for combustion air for this stove is via the sliding damper control on the right rear of the stove, as you face the unit. Please ensure that the damper control is in the open position when burning the unit. Excellent customer service at a fair price. Stove was delivered as promised. These guys were very easy to deal with and delivered as promised. No surprises. I haven�€™t fired up the stove yet but it looks like a very sold unit. We had a problem with our previous stove, so I had to get this stove to heat our house. While I was changing it out with the old one, the temperature was below -8 degrees, and the house had dropped to 64 degrees. After less than an hour heating our house, it had gotten so hot inside (think 80s) that I had to install the thermostat. The fan in my house's air-conditioning moves the heat from my basement (where I have the unit installed) to the rest of my house. It hasn't had any problems with heating 1900 square feet of space, and that is without trying hard. This has been my third season using this stove, and the only problems I had were in the first winter. For some reason the auger wasn't mounted to the motor properly, but after replacing all the bolts with parts that were a little better than the stock ones, I haven't had a problem since. The amount of air that the circulation fans will move is quite impressive. I ran some ducting into the living room, and the fans easily carry plenty of warm air up from the basement. It has done wonders for our heating bill this winter, and heats very evenly. I haven't had any problems yet. Everyone who has seen our stove in action (a 3000 square foot building, completely heated) marvels at the fact that it can heat so much space. Apparently this model is quite popular, because the stove pipe that you need to get it installed seems to always be back logged. Everything came packed up nice and tight, and installation was simple and easy. If you are in need of an excellent stove, I'd say get this one. We originally had a 35,000 BTU stove, but since it couldn't fully heat our house we decided to replace it with a Drolet Eco-65. The amount of air that this unit circulates is absolutely amazing! It can easily heat our whole house when it is set to run on the lowest amount of fuel. Even though it runs all the time, it uses much less fuel since it doesn't run very high. It takes around two weeks for the tray to fill up, but until then we can let it run continually. There has only been one issue that we have encountered, and I would still call it more of an inconvenience. It will jam when 120 pounds of pellets are loaded into the feeder, and in order to fix it you have to remove all of the pellets. I have since discovered that if you put in 80 pounds or less the problem is completely eliminated. So far this stove has more than met my expectations. With winters getting down to 10 or 15 degrees where I live, this stove is exactly what I needed. I have had trouble with oil furnaces being unreliable in the past, so when this stove put out a nice, steady heat I was overjoyed at how much like a normal wood stove it was. I could recommend this to anyone wanting a better way to heat their house.